Or so our local guide told us. Laos is actually called Laos PDR which our guide told us stand for Laos, Please Don’t Rush! And boy does that sum up our time in Laos. After the hustle and bustle of Thailand Laos was like a breath of fresh air. 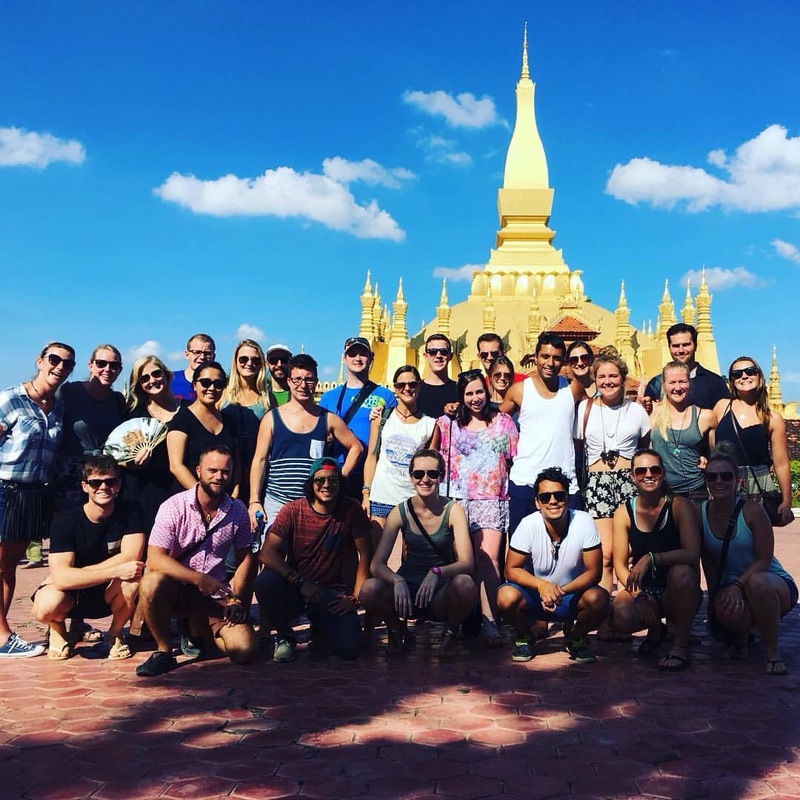 Our first two days in Laos were interesting because we were without a tour manager – Lisa had to go and start a new tour and our new manager wasn’t due to join us until Luang Prabang. 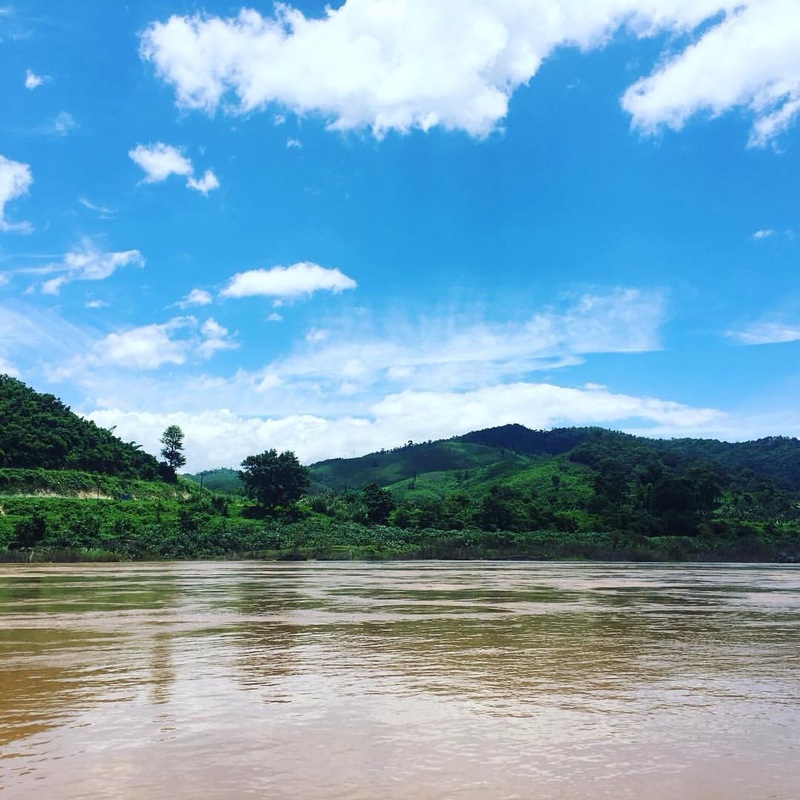 We somehow managed to get across the border without any dramas, and soon enough we were on a slow boat winding our way up the Mekong River. I wasn’t sure what to expect from Laos but I have to say it absolutely blew me away. The landscape and scenery are absolutely breathtaking, rivalling even the Swiss Alps (which as you all know is my favourite place in the whole world). Pumping music while waving at random kids on the riverbank, everyone really began to unwind and make friends on this part of the trip. After about six hours on the boat we arrived in to Pakbeng, a tiny one-street town about halfway to Luang Prabang. Our local guide, Mr Khammy, showed us the markets and described some of the local delicacies including frog and scorpions. We then all ran into one of the wifi cafes to get some connection and let everyone back home know that we’re still alive. For dinner we had some traditional Laos food. My roommate Dani really hates spicy food so I took on the role of official food taster to check spice levels before she ate. No complaints from here! For the first time I actually ate fresh pineapple (I don’t like pineapple usually) and discovered that I have an intolerance to it. Oh well luckily I never eat it back home anyway. The next day it was back on the boat for another six hour trip. We stopped off at the Pak Oun caves, some really cool caves set into a cliff filled with stone and ceramic Buddha statues. The time on the boat went really fast – could happily have spent another week chilling on the boat with everyone having random dance parties and endless games of Uno. 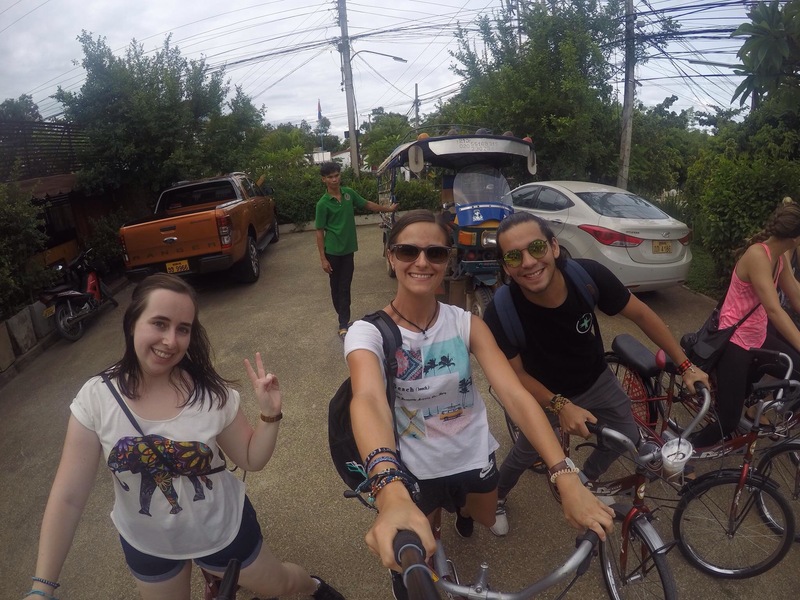 We finally arrived in to Luang Prabang later that afternoon ready for a bike ride. And oh my god it was hot. I have never felt humidity like it before – now imagine riding a bike and having to wear temple wear in it! The ride was totally worth it though as we went to the oldest temple in Luang Prabang before jumping in the pool back at the hotel. That night we wandered to a local restaurant with Mr Khammy before going to (yes, again) the night markets for a visit. 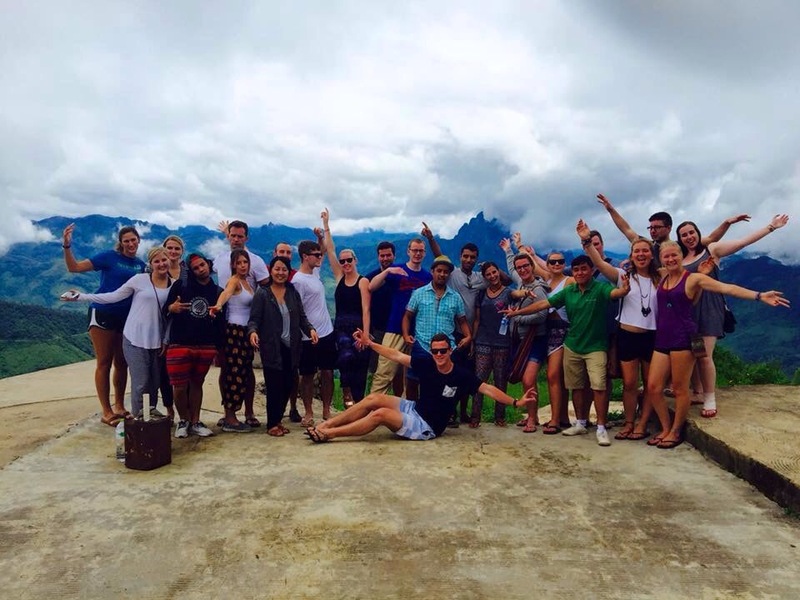 The next day was a completely free day when most of the group went to the Kuang Si waterfalls. Sadly I hurt my ankle the night before and couldn’t walk so I spent the morning at the hospital and the afternoon napping and hanging out with Dani watching a show about some lions on Nat Geo. If anyone has any questions about male lions in Africa Dani and I are happy to help. The day after was a super early 5am start to go and give alms to monks in the city. It was definitely worth the ungodly wakeup hour to see the people of Luang Prabang out on the streets giving food to the monks. Oh and we picked up our new tour manager here, Tim. 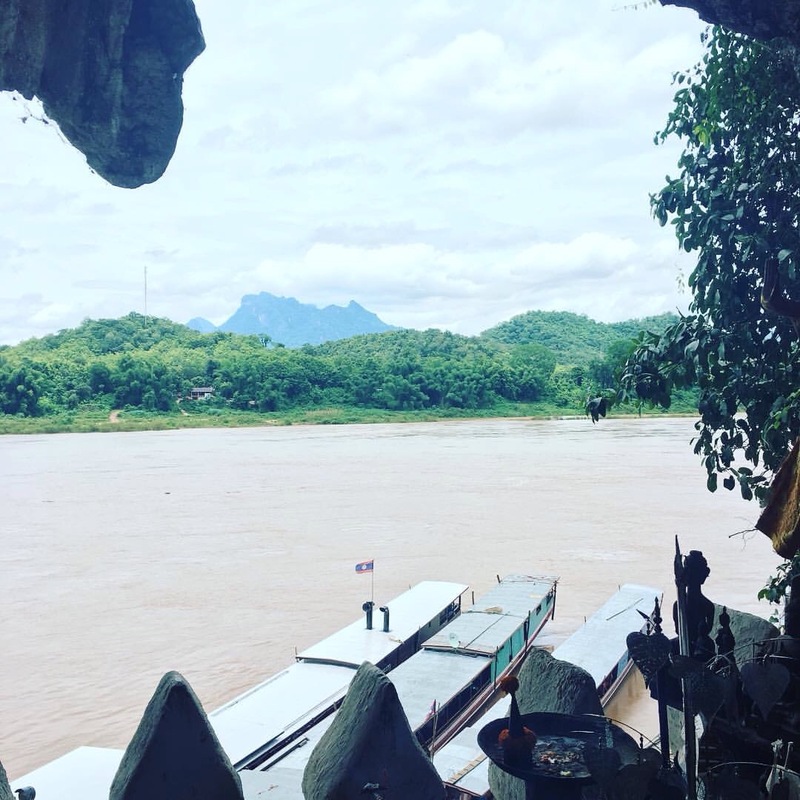 Eventually we left Luang Prabang to head to Vang Vieng, a super cool backpackers hangout famous for the bars along the river that you can tube to (sadly it’s been shut down now and we couldn’t do it…). We stopped at a place called Spectacular Views for lunch before arriving at our hotel. That night we went to the awesome Kangaroo Sunset bar for dinner and drinks (and actually started drinking so early that almost everyone was done by 9pm). 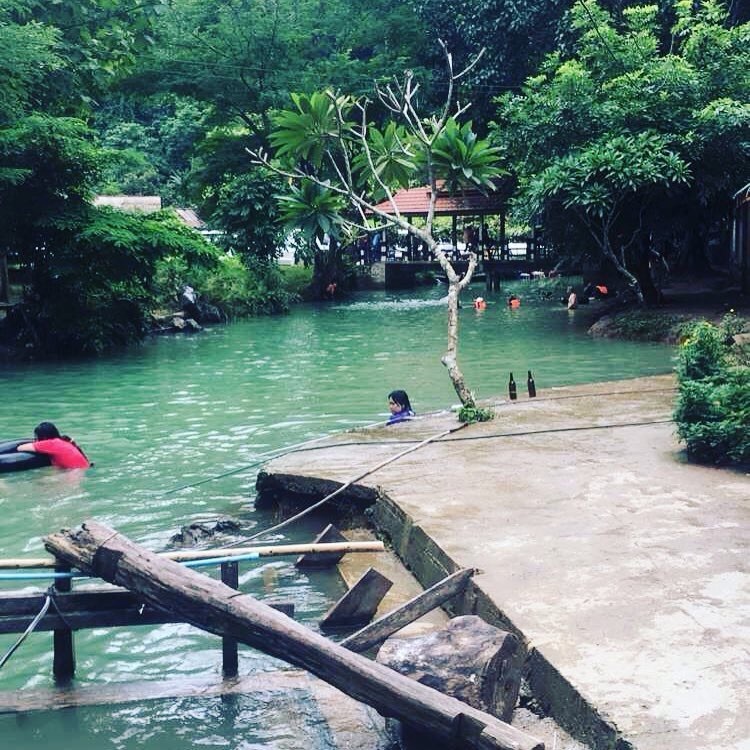 The next day a bunch of us headed out to the Blue Lagoon for a swim and chill which was a nice way to end our time in Vang Vieng. Our final stop in Laos was Vientiane, the capital. After Luang Prabang I found Vientiane a bit of a disappointment, it just felt like another big city. We saw the Arc de Triomphe and Golden Temple before going to the hotel for a swim. And boy was this a pool none of us will ever forget. We were casually hanging out, chatting and dancing in the water when suddenly someone spotted something floating through the water. I have never seen 26 people move so fast in my life – everyone leapt to the edge of the pool until Caitlin (bravely) edged over to investigate. Next minute she jumped, I kid you not, about 5 metres in one leap when she realised what it was. Yes, there was a condom in the pool. To this day we still don’t know who it belonged to although we have our suspicions! After another set of night markets, our time in Laos came to an end. Overall I have to say Laos was my favourite country in South East Asia. 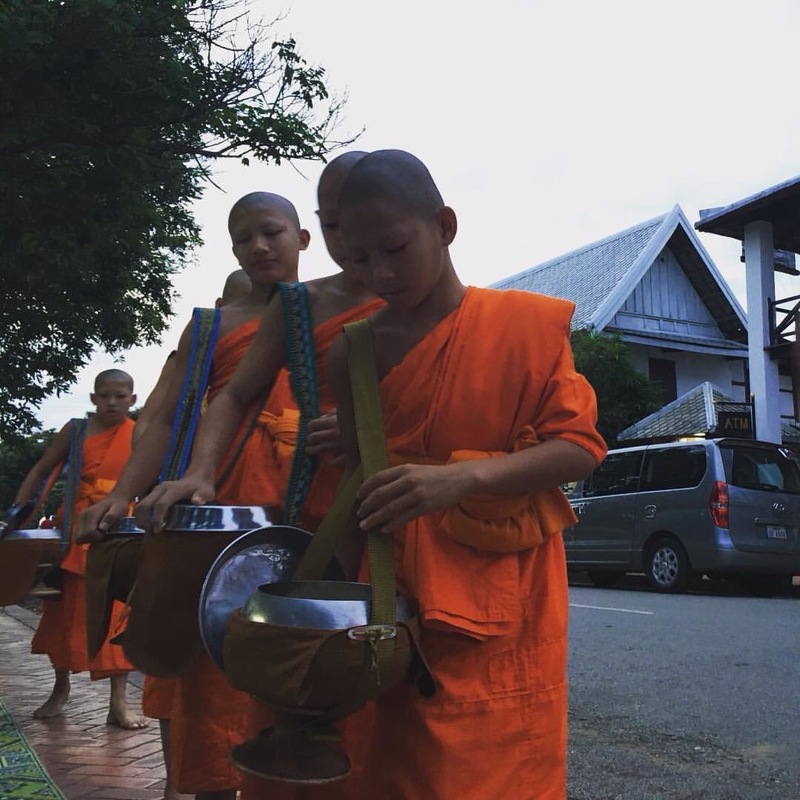 tl;dr: Laos is frigging awesome and everyone should go there. Trip Manager count – 4.